Imelda Reyes, DNP, MPH, assistant clinical professor at the Nell Hodgson Woodruff School of Nursing, will be inducted as a fellow of the American Association of Nurse Practitioners during the organization’s National Conference in Denver, Colo. this summer. Induction into the AANP Fellowship is considered one of the highest honors for nurse practitioners. Fellows are elected through a highly selective process that recognizes nurse practitioner leaders who have made outstanding contributions to health care through clinical practice, research, education and policy. Reyes, who serves as specialty coordinator for the School of Nursing’s Pediatric Primary Care Nurse Practitioner program, has made significant contributions to nursing education through her innovative teaching style and use of technology. She developed a more robust form of Objective Structured Clinical Examinations (OSCEs) to help ensure that nurse practitioner students gained the clinical competencies needed to provide safe and quality care. Her approach incorporated web-based tools and helped students hone their critical and analytical skills while providing a more comprehensive evaluation of student progress and clinical competency than can be gained through traditional multiple-choice exams. She developed a neonatal and pediatric approach to advanced health assessment that involved real children and families in unscripted simulated assessments to teach students how to speak with children and families to obtain thorough histories and assess their health care needs. 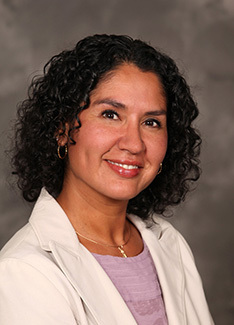 Reyes developed curriculum mapping specific to the Pediatric Primary Care Nurse Practitioner program that helped identify gaps and redundancies, refine teaching techniques and improve the overall cohesion of the curriculum. In addition to her accomplishments as an educator, Reyes has advanced local, regional, and national initiatives to address childhood obesity. She is an expert on culturally-sensitive care approaches for obese children and their families and advises several Children’s Healthcare of Atlanta (CHOA) teams that address childhood obesity throughout Georgia. Her research on the evaluation and management of childhood obesity within primary care clinical settings led to the development of a quality indicator within CHOA Chamblee’s Primary Care clinic. The clinic integrated American Academy of Pediatrics (AAP) guidelines into the electronic medical record, greatly improving the efficiency and quality of care delivery. Her work has been published in many peer-reviewed journals, including the Journal of Nursing Education, the Journal for Nurse Practitioners, and the Journal of Pediatric Health Care. Reyes has received many honors for her leadership and contributions to nursing education. She was named Outstanding Educator of the Year by the Association of Faculties of Pediatric Nurse Practitioners (AFPNP). She serves as chair of the AFPNP’s Objective Structured Clinical Examinations Taskforce and as the legislative chair of the Georgia Chapter of the National Association of Pediatric Nurse Practitioners (NAPNP). She also serves as president of the NAPNP regional chapter.